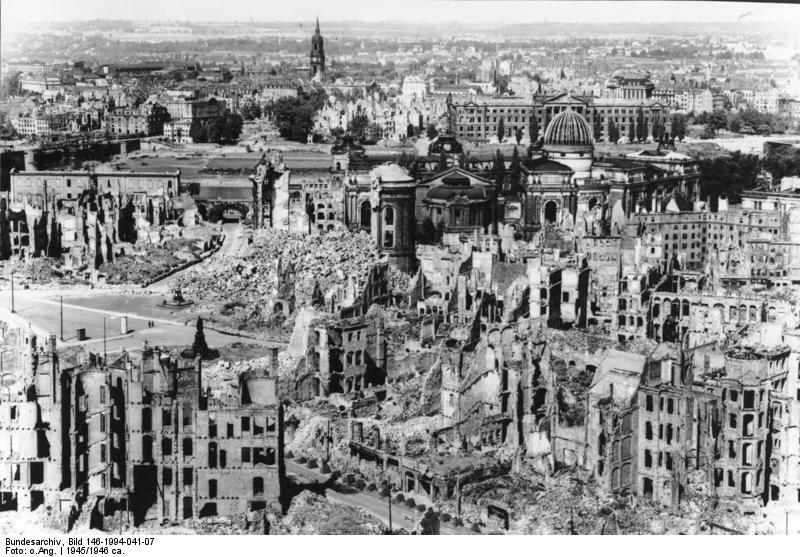 Citations - The controversial WWII bombing of Dresden. The controversial WWII bombing of Dresden. national archives. the governemnt, n.d. Web. 17 Nov. 2010.
site's primary source provided an opinion on the morality of the bombing. (#11) Hoffmann, Peter. "Flucht aus dem brennenden Dresden 1945 ." Kollektives Gedächtnis . N.p., n.d. Web. site, being a German site, opens up a whole new area to research the topic. (#10) Metzger, Lothar. "The Fire-bombing of Dresden An eye-witness account." http://timewitnesses.org. provided a firsthand account of the bombing. (#8) WWII Germany. Map. [Germany]: n.p., 1945. Print. showed Dresden in relation to rest of Germany. what the actual death tolls of the bombing may have been. "Bombing of Dresden." Spartucus.schoolnet. N.p., n.d. Web. 19 Nov. 2010.
primary sources. basically it is a page with several sources in it. (#2) "Charles Portal." Spartacus Educational. Spartacus Educational , n.d. Web. 29 Dec. 2010.
who helped to develop area bombing. people_commanders.html>. This site provided info about Arthur Harris. (#4) Hickman, Kennedy. "World War II: Marshal Arthur 'Bomber' Harris." About.com. New york times, 2010. Web. 19 Nov. 2010. <http://militaryhistory.about.com/od/airforce/p/bomberharris.htm>. This page provided details of about the bombing. (#6) "International Law on the Bombing of Civilians." Dannen.com. Gene Dannen, n.d. Web. 1 Dec. 2010.
concerning civilian bombing. Which was a major aspect of area bombing. (#1) Siebert, Detlef. "British Bombing Strategy in World War Two ." BBC . BBC, n.d. Web. 2 Dec. 2010.
a source for reliable information about RAF area bombing during WWII. Smoler, Fredric. "Was the American Bombing Campaign in World War II a War Crime?" AmericanHeritage.com . American Heritage Publishing. , n.d. Web. 30 Nov. 2010. (#9) USAF Historical division. "HISTORICAL ANALYSIS OF THE 14-15 FEBRUARY 1945 BOMBINGS OF DRESDEN." "The WWII Dresden Holocaust - 'A Single Column Of Flame.'" rense.com. Jeff Rense, n.d. Web. 18 Nov.
on the morality of the bombing. "Yalta Conference." Spartacus.schoolnet. Spartucus.schoolnet, n.d. Web. 29 Dec. 2010. The following applies to any pictures or videos used in this site, and are reffered to as "media"
I claim no right to the media. The media is used solely for educational purposes, and is the property of its respective owners. I will do my best to list the sources of said media. Below are the links and any relevant information concerning any media used in this site. The reason I choose this topic is that it was suggested by a teacher after my original topic was found to be inadequate, as well as the fact that I found the topic interesting. In terms of the research itself, the majority of the sources I found were online. They were located through numerous searches with Google, Google scholar, and other online search engines. The most useful sources that I found were the various websites published by the BBC, and “Spartacus.schoolnet”. These two sources provided the most volume of useful note cards, and seemed to be very reliable. Non-internet research was conducted at the MPLS Central library, this yielded several useful sources. I decided to make a website as my project for several reasons: I like computers, I have always wanted to make a web site, and I have some prior experience dealing with HTML and other programming languages involved in making a website. I created my project using Weebly, as is required. I decided to structure the body text of the site around quotes, which are presented in large blue text. The debate is set up with an introduction, and three main points of the debate that are presented as separate pages. Consequences are also presented as a separate page. My topic relates to this year’s history day theme in that it involves a large historical debate which contained examples of diplomacy, consequences and failure.